Welcome back to Preparedness Tip Wednesday where we share a tip with you to help you get prepared in case of an emergency. For other Preparedness Tips check HERE and HERE. I found this post on Pinterest and I thought it was important enough to re-post it for all of you to read. Everyone knows that having food and water storage is crucial in the event of an emergency, but gas storage is of almost equal importance. 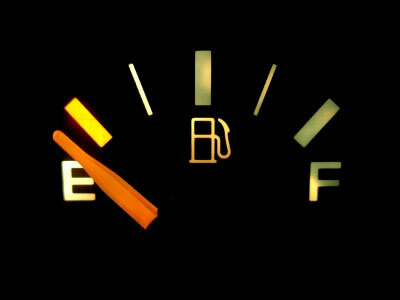 I always stress the importance of never letting your gas tank get below the half way mark, it cost the same to fill up the top half of the tank as it does to fill up the bottom half. If you live by that you’ll be grateful that you have that fuel if you need to bug out and gas is hard (or impossible/expensive) to come by. Plastic gas cans or “Jerry Jugs” are readily available, and cost a lot less than metal cans. DO NOT store gasoline in containers that are not intended for that purpose! Five-gallon cans are recommended. Gasoline weighs a little over 6 lbs at 72 degrees F (slightly more at colder temperatures) so a 5 gallon container will weigh a little over 30 lbs, which is fairly manageable to carry around with you. How much gas you should keep on hand is largely dependent on how much space you have to store it. There’s only so many cans that you’ll be able to fit in your vehicle along with your other essential items. Store as much as you can, but not to the detriment of food, water and other vital supplies. Hey looters! Come and get it! It’s important to note that gas will become a valuable barter item in a post-collapse scenario, but it will also make you a target for thieves and looters. So make sure you keep your gas reserves stowed away out of sight. If your plan is to strap your gas cans to the roof or outside of your vehicle, you might as well put a sign on your car that says “Free Gas”, because that’s ostensibly what you’re doing. If you’re carrying gas in the back of a pickup truck, keep it covered with a tarp, or better still, put a lockable cap/camper shell on the back of your truck to protect your belongings. This won’t completely stop a determined thief from stealing your gear, but it could deter him or delay him long enough for you to do something about it. Proper gas storage practices are essential for safety as well as keeping your gas stable and viable for a maximum length of time. A properly sealed can that is designed for storing gasoline should not leak vapor, but it’s still recommended that you store gas in a well ventilated area. Keeping the gas can out of the sun and excessive heat will minimize the expansion and contraction of the can. Add a fuel stabilizing product like STA-BIL or PRI-G (PRI-D for diesel) to the gas for long term storage and it will keep the gas fresh for 12 months. Just as with food and water storage, make sure to mark the cans with the storage date (the date that the fuel stabilizer was added). As your gas storage approaches the 12 month mark, pour it into your gas tank and refill the can with fresh gas. So don’t neglect storing gas in your preparedness plan. Even if nothing disastrous happens, with the way gas prices have been fluctuating over the last year, buying gas while prices are relatively low means you won’t get pinched as hard when that roller coaster peaks again. As a final note, make sure to check with your local fire department about any fuel storage regulations in your area."